MANILA, Philippines – Citing the importance of spending quality time with family as the reason for the amendment, the Department of Education (DepEd) amends the start of the Christmas break, making it a week earlier than usual. DepEd Order No. 25, s. 2018, which announced the School Calendar for School Year 2018-2019, stated that the Christmas break starts on Saturday, December 22, 2018. But this has been amended by DepEd Order No. 49, s. 2018 to a week earlier: on Saturday, December 15, 2018. The Order clarified, though, that December 15 remains a class day intended for student activities. “The Department of Education values the importance of spending quality time with the family. The Christmas season provides an opportunity for Filipino learners to strengthen their emotional bonds with their family,” Sec. Leonor Magtolis Briones explained in the Order. But to ensure that the required competencies are met despite the change in schedule, Briones also directed Regions, Divisions, and Schools to review the Budget of Work (BOW) on curriculum implementation. 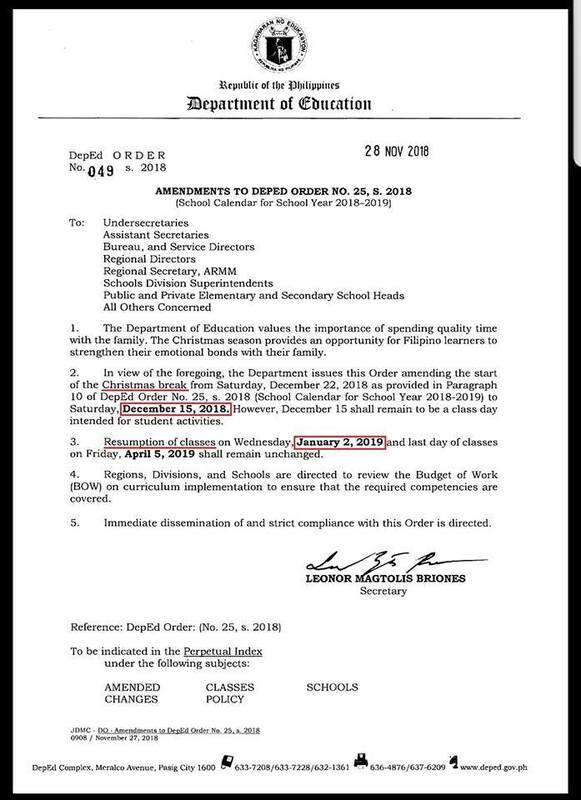 Though the start of the Christmas break was amended, the Order from the Education Secretary regarding the amendment clarified that there were no changes to 1) the schedule of resumption of classes which will be on Wednesday, January 2, 2019, and 2) the last day of classes which will be on Friday, April 5, 2019. Sec. Briones reminded all concerned to strictly comply with the order. The move was met with cheers on social media; however, a number of people were confused why December 15 was classified as a class day when it falls on a Saturday. A number pointed out that the break will start on December 16, considering that December 15 was considered a class day. For clarification, classes scheduled on December 15, Saturday, will still push through but for most students who don’t really go to school on Saturdays, the day would already mark the beginning of their long Christmas break.